We just had our first in-depth experience with the Vizio Tablet, the company’s opening overture into the world of Android slates, and we’ve got to say — we like what we see. The device — which was just announced Monday afternoon along with the company’s new smartphone, the Vizio Phone — is still rather unfinished (the model we looked at was a hand-built device), but based on this early look, the company is moving down the right roads. We had a good chance to play around with the tablet, and we’ve got all the details, specs, and an in-depth video after the break! The hardware itself is extremely clean, but manages to retain some personality. The device is about the same thickness as the iPad, and has a similar glossy black front and bezel, though around back you’re treated to a stylish, matte gray finish. The screen itself is an 8-inch LCD clocking in at 1024 x 768 (pixel density looks tighter than the iPad, due largely in part to that smaller screen), and is fairly responsive to touch — though again, the software is quite early. Since this isn’t an IPS display, the viewing angles weren’t mind-blowing, but they seemed perfectly acceptable. Inside, there’s a “1GHz plus” CPU, though the company wouldn’t fess up to the make and model. Likewise on the memory, but there is 4GB of storage inside (2GB for user, 2GB for the OS), but there’s a microSD slot present. Speaking of, along the bottom of the tablet is a Micro USB and HDMI port, a volume rocker on the right side, two speakers on the top (when in portrait), and another speaker on the right side (when in landscape). That’s of particular note, because the company has partnered on with SRS on a surround sound emulation that works in both orientations. It’s pretty damn cool. Also cool? The device has an IR blaster built in to the top (in portrait), and it can function as a universal remote. 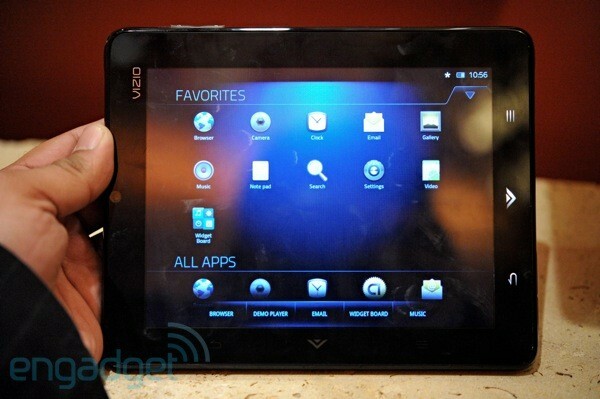 The tablet is running Android, though Vizio didn’t say what version. To our eyes it looked like a variation on 2.2 or 2.3 — we didn’t see any indication that it was Honeycomb. There’s still some rough animation and very buggy aspects to the UI, but many of the ideas are incredibly solid, like the notification window which groups by application and age, as well as the ability to create your own folders or groups of applications and quickly page through them. The tablet is meant as a component of the company’s VIA Plus ecosystem, meaning there are going to be a lot of hooks into Vizio HDTVs and other products the company produces. Vizio isn’t talking about price, though reps were emphatic about being “very competitive” with players in the market. We also didn’t get a solid release date, but the company is targeting a summer launch. We’re going to try and get some more face time with this device as the company builds out the OS and gets some final hardware, but for now, enjoy the hands-on video, and check out some close-up pics in the gallery. Along with Vizio’s new tablet, we had a chance to look at the HDTV maker’s new Android device, unsurprisingly dubbed the Vizio Phone. The phone is still in the early stages (both the hardware and software aren’t production ready at all), but there’s a lot of promise on both the industrial design and user interface sides. We had a chance to go hands-on with the phone and take a pretty deep look at the UI, so follow along after the break for lots more info and a complete video walkthrough of the Vizio Phone! Just like its tablet big brother, the Vizio Phone is a sleek, lean, mostly black device which is handsomely and thoughtfully designed. The front is a dark, gloss black bezel, while the backside is covered in a soft touch material that almost feels like metal (though we think it’s a harder plastic most likely). The display is a 4-inch LCD clocking in at 854 x 480 — we’re big fans of the slight resolution bump (think Droid), and even though this is an early, hand-built unit, the color balance and clarity seemed pretty top notch. Inside, the phone sports a 1GHz “plus” CPU, but just as with the tablet, Vizio reps wouldn’t tell us who the maker was. Also as with the tablet, there’s 4GB of storage onboard, a microSD slot, Micro USB port, and HDMI port. Continuing the trend, the phone will feature the same kind of IR setup, allowing you to use it out of the box as a universal remote. There’s a VGA front-facing camera present, as well as a 5 megapixel shooter with flash on the backside. This device appears to be running Android 2.2 or 2.3 with the heavy Vizio skin, which is easily one of the most beautiful and useful variations that we’ve seen of Android. 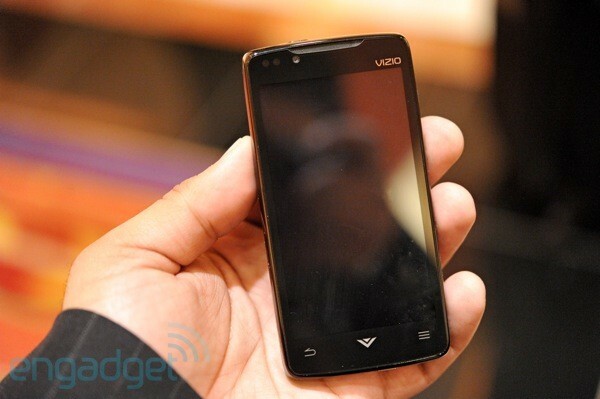 In some ways, what Vizio is doing from a design and usability standpoint put the Vizio Phone in an iOS or webOS class. We need to see a lot more of how this is going to perform, but we’re definitely excited about the direction the company is taking. We’re also excited to see how the VIA Plus integration plays out (the company’s ecosystem which encompasses a large swath of its devices), but it looks like we’ll have to wait a bit on that. A summer release window is on tap here as well, and again the company isn’t talking price (or carrier) at this point, but again emphasized its desire to be competitive. Of course, reps also emphasized that Vizio has a large presence at important big box retailers in the US like Walmart and Target. We’re going to be hounding the company for more time with this thing — but for now, enjoy the photos and video we nabbed at CES! This entry was posted in communication, mobile computing, multimedia, tablet computing, technology, telephones and tagged Engadget by anatango. Bookmark the permalink.